Enjoy the luxury of a shady reprieve outside with this gorgeous Andrews Soft Top Gazebo. It's simple to set up, so you'll be enjoying your new oasis in no time at all! This attractive, two-toned gazebo also features full length mosquito netting, which allows for you and yours to enjoy time outdoors without being bothered by bugs or buzzing. Andrews 8 ft. x 8 ft. Soft Top Gazebo with Vented Canopy Enjoy the luxury of a shady reprieve outside with this gorgeous Andrews Soft Top Gazebo. It's simple to set up, so you'll be enjoying your new oasis in no time at all! This attractive, two-toned gazebo also features full length mosquito netting, which allows for you and yours to enjoy time outdoors without being bothered by bugs or buzzing. 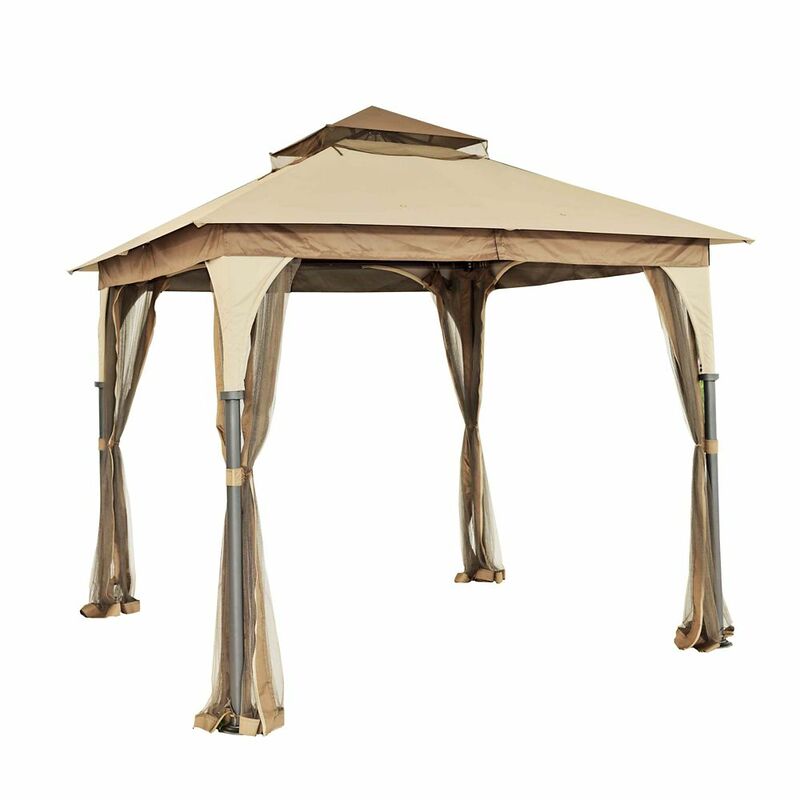 Andrews 8 ft. x 8 ft. Soft Top Gazebo with Vented Canopy is rated 4.2 out of 5 by 22. Rated 4 out of 5 by Thor from Need 3 or 4 helpers to lift roof and hold... Need 3 or 4 helpers to lift roof and hold it while legs and arches are bolted on. Arch brackets at corners are tricky to thread bolts through fabric and bolt holes at same time the arch tension is working against you. The weakest point in the frame system is the under built roof frame. Right where the frame connects (above the zipper on each of the 4 sides) is very weak. Our gazebo blew over after two weeks and, two of these under built sleeve connections failed and bent. If your yard gets wind above 10 mph make sure each post is well anchored (wire, re-bar rods, cinder blocks etc.) .Also I suggest a guy line from the top of each post to a large ground stake to give the top stability in wind. If your yard is protected from wind this item is a very good value for the price...it looks great. But if you get wind you should consider a model with a heavier grade frame or else you will have to do some extra work anchoring this one. Rated 4 out of 5 by Jann from so far I love my gazebo. I have it on my back porch and can sit and read my books. was fairly eas... so far I love my gazebo. I have it on my back porch and can sit and read my books. was fairly easy to but together. it does that two people to set it up on the legs but it was not heavy to work with. Rated 4 out of 5 by Kfh from Just what I wanted; however, two parts had holes in... Just what I wanted; however, two parts had holes in the cloth and I had to get replacement parts. Rated 5 out of 5 by HomeDepotCustomer from Definately a good buy for what the price is. Only... Definately a good buy for what the price is. Only problem was the instructions could be better. Rated 3 out of 5 by Cassey from Pole was bent.... Pole was bent. Rated 5 out of 5 by Kelsey from Easy to i stall but needs 2 people. Easy to i stall but needs 2 people. Rated 5 out of 5 by HS22 from Easy to set up. Excellent for keeping out sun. We zip up & store our pool floats inside to keep t... Easy to set up. Excellent for keeping out sun. We zip up & store our pool floats inside to keep them out of wind/storms. Screwed ours into deck for stability. Perfect! Rated 5 out of 5 by jimde from Assembling this gazebo is easy for 2- people. It took us about an 1 1/2 hours, at a leisurely pac... Assembling this gazebo is easy for 2- people. It took us about an 1 1/2 hours, at a leisurely pace, to assemble. So far my wife and I are pleased with this gazebo, it's looks, it's materials and it's ease to assemble. Now all that's left is to secure it to or cement patio, I already purchased the cement screws and my sons will help secure it to the deck. where can I buy the canopy? Hi Kevin, Thank you for your interest in our product. You can buy a replacement Canopy for the Andrews 8 ft. x 8 ft. Soft Top Gazebo and just call our customer service 1-866-578-6569 for assistance or visit our website www.sunjoyonline.com. Does this gazebo need to be tied down for support, or is it free-standing? Can you buy a replacement cover?? Yes, you could purchase a replacement canopy from our Sunjoy if you call our US cs center at 1-866-578-6569 from 8:30 am to 4:00 pm EST Monday to Friday. Are privacy curtains and/or mosquito netting available for this unit? If so, where can I get them? We only have the netting in stock for this model and you could call our Sunjoy US cs center at 1-866-578-6569 from 8:30 am to 4:00 pm EST Monday to Friday to order the replacement netting. How sturdy is this in heavy wind? I live in a very windy area. How sturdy is this gazebo in high winds? Hello, The gazebo&rsquo;s roof and structure are not guaranteed against extreme weather conditions (storms, high winds, etc.). This gazebo is not a permanent structure and should be disassembled &amp; stored away after use. Hello, yes, this Gazebo fabric is water resistant.